On the Yucatan Peninsula in Mexico, geologists are drilling one of Earth's three largest impact structures, hoping to reveal clues about a devastating event linked to the extinction of the dinosaurs 65 million years ago. An extraterrestrial impact 36 million years ago left a lasting impression in the Chesapeake Bay and continues to affect the region's environment today. In Nevada, with no visible crater, researchers are piecing together evidence of a 370 million-year-old impact based on widely dispersed pieces of rock. Carolyn Shoemaker reflects on a lifetime of work with her husband Gene, uncovering impact structures around the world. Want to write science news? Apply for the Geotimes summer internship! Taking a trip? Check out Travels in Geology to find geologically significant places to visit. Although the near-term risk of a catastrophic asteroid collision on Earth may be slim, scientists acting now can provide insurance to protect future generations. The 2003 Energy Bill: Did Politics Trump Science? In her first months on Capitol Hill, a new congressional science fellow is already realizing that all politics are local, particularly when it comes to the nation's energy strategy. This year's Earth Science Week featured contests and events to celebrate the role scientists play in monitoring Earth. Become a daredevil volcanologist through the eyes of four recently published books. 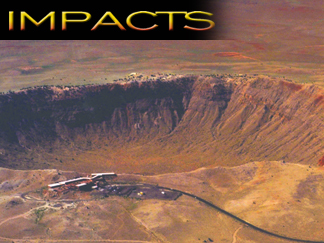 With a diameter of about 1.2 kilometers, Meteor Crater (also known as Barringer Crater) in northern Arizona was the first terrestrial impact crater researchers recognized as such, based on studies in the 1950s by Gene Shoemaker and colleagues. Today, scientists have identified about 170 impact structures throughout the world formed by extraterrestrial impacts. Read more on Impacts in Space and on Earth and throughout this issue. Image copyright of Meteor Crater Enterprises. Right top: This Advanced Spaceborne Thermal Emission and Reflection Radiometer image reveals the fire fronts of the Old and Grand Prix fires that raged in the San Bernardino Mountains at the end of October 2003. Vegetation is green, burned area is red, smoke is blue, and the fire front is pink. Read the story. Image courtesy U.S./Japan ASTER Science Team. Want to write science news? 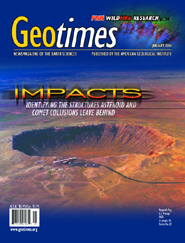 Apply to be a Geotimes summer intern!